My dad introduced me to Subbuteo too young. I was seven and unable to appreciate or protect what might otherwise have been a valuable heirloom. His prized West Ham team, strokes of claret and blue paint unsullied by sponsors, their stance as proud as Kings, died so easily. An errant knee did for Bobby Moore. Stan Cullis’ mighty Wolverhampton Wanderers were decimated by an unexpected cat attack, snatched away midway through the first half and tossed down the stairs in a sickening display of strength and cruelty. In the days before the rise of the games console, Subbuteo was a ubiquitous presence in British toyshops. 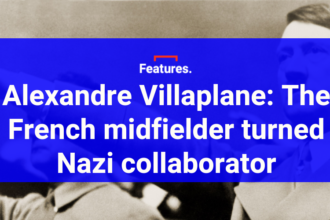 Starter kits offered up two teams, pitches, goals and a ball, but there was so much more than that. Glossy catalogues teased the young enthusiast, offering anything from advertising hoardings to sweeping stands populated by hundreds of tiny supporters. In an era when clubs rarely considered changing their kits, Subbuteo could offer up literally hundreds of teams. Toy shop owners piled them up behind the counter. Do you need a Go Ahead Eagles team? It’s number 86 and it doubles up as Kastoria of Greece. What about the Nottingham Forest second kit? Number 168. You might as well, it’s also the Brighton second kit and the Bodo Glimt first kit. But then Sega and Nintendo arrived in town. Commodore and Atari upped their game. Sensible Software developed a game more vibrant and playable than anything that had been seen before on Spectrums and C64s. Subbuteo was left behind. But it’s still out there. It still exists. And it’s actually quite good fun. So much has changed while we were looking in the other direction. Heavily policed licensing has brought an end to the wide range of kits. Only a handful of official teams are now available, the usual suspects of Manchester United and Liverpool, Celtic and Rangers, England and Scotland, and various other safe bets. A few generic teams, black and white stripes, all white, red and white stripes, are available if you look hard enough. For anything more exotic, you’ll have to go to eBay. But the players are different now. Constructed of some kind of rubber-plastic hybrid, it’s impossible to break them. The manufacturers tell us that you can run them over with a car and they’ll spring back up, but that felt a bit too much like a summary execution, so we just tugged them back and forth with impunity. They are now knee-proof. And probably cat-proof too. They look a little like real footballers, all with accurate, though swiftly out of date, shirt numbers. There is something very relaxing about setting up a game of Subbuteo. You pull the pitch taut and use the flat of your hand to tenderly remove creases. The pitch doesn’t crease easily now which is a relief to anyone who had to beg their parents to iron it into shape. But the most satisfaction is derived from the careful deployment of your players. It feels so precise. Like Chess, but better. And then you begin. And that’s where the problems start. 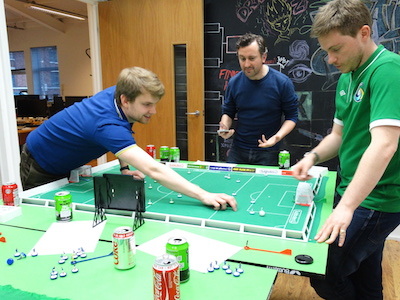 Outside of a select and passionate few, hardly anyone actually knows how to play Subbuteo. You and your opponent may need to go slowly at first, stopping repeatedly to check the rules on positional flicks. It’s not entirely intuitive, but nor is it too difficult to pick up. In our competition, entrants who hadn’t flicked to kick since the 1980s were engaged in frantic back-and-forth within an hour. Granted, we had loosened the rules for them, but even without our liberalisation the learning curve is not insurmountable. Is it still fun? Yes, once you’re familiar with the rules, it is. Lining up a pass like a pool shot and then executing it perfectly is a very fulfilling experience. It doesn’t take long for rough and ready tactics to develop as you try to draw out your opponent by pushing up and inviting them to play risky long range passes, or you use your defensive flicks to discretely position for a counter-attack. How long you’ll continue to play is another matter. Having eight players and a fridge full of free beer makes for a lot of fun. But how often does that happen? When you and your flatmate have an hour to kill, will you reach for this or the Playstation controller? Probably the latter. It’s quicker and easier. 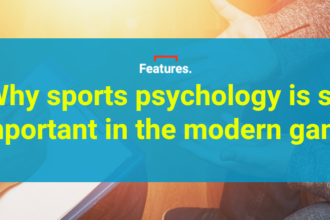 Modern life has changed our habits and Subbuteo is not alone in falling victim to our preference for convenience. 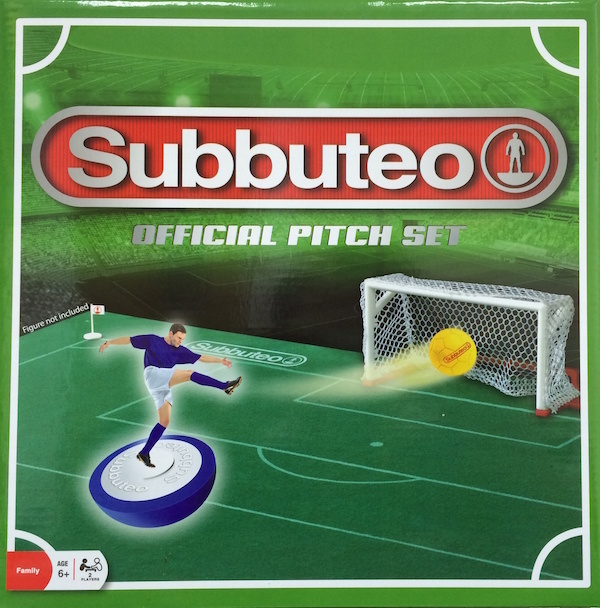 But that doesn’t wipe Subbuteo out completely. Social networks and specialised cafes make it easier than ever to find like-minded souls and no technological advances have yet eradicated the desire of British people to play board games at Christmas. 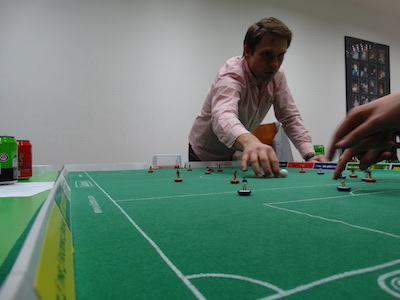 The real lure of Subbuteo, the outrageous geekiness, the extraordinary range of products and kits, has gone now. That’s the real sadness. But it can live on in its new form. It’s still available, it’s still fun and, for all that lost geekiness, at least you can give it to a seven year old now and know that they won’t break it.